This is a developing story and will be updated this afternoon. An extension of the controversial Mountain Valley Pipeline has been proposed for North Carolina, potentially opening the door for fracking operations in Rockingham County. 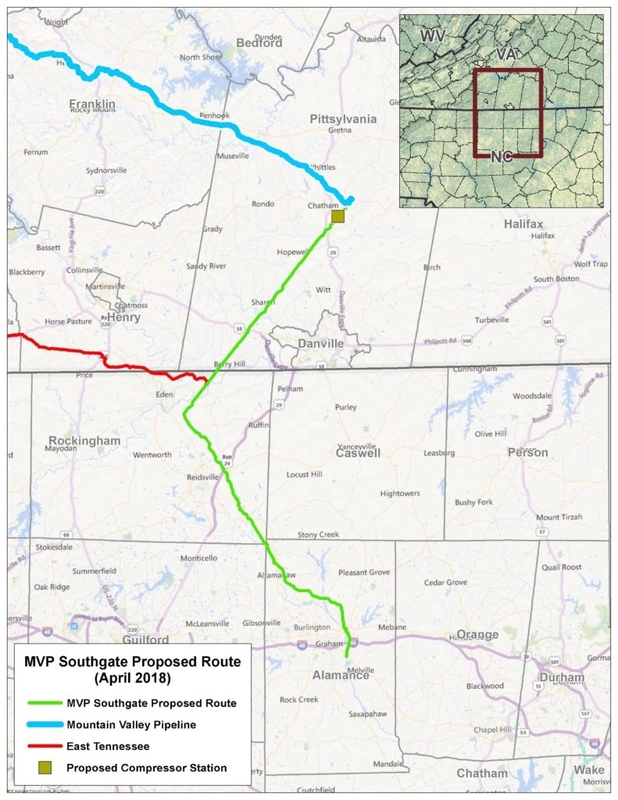 Known as MVP Southgate, the 300-mile pipeline would extend from Pittsylvania County, Va., into Rockingham and Alamance counties. Once in North Carolina, the pipeline would route for about 50 miles: east of Eden, north of Reidsville and then into Alamance County, near Graham and I-40. The routing is ominous because western Rockingham County is one of the areas of the state eyed for fracking. Rockingham County, along with Stokes County, sit atop the Triassic Rift Basin, thought to be a source of methane. Coincidentally, the state’s Oil and Gas Commission recently reconvened after being on hiatus for several years. Headed by Jim Womack, an avid fracking proponent from Lee County, the commission is expected to restart the interest in natural gas exploration in North Carolina. Chatham and Lee county governments both have established moratoria on fracking; earlier this year, Womack said the oil and gas commission would challenge those moratoria. Like the Atlantic Coast Pipeline, which is running through 160 miles in eastern North Carolina, the MVP starts at a fracked gas facility in West Virginia and routes through Virginia. MVP is owned by a conglomerate: EQT Midstream Partners, NextEra Energy, Inc., Consolidated Edison, Inc., WGL Holdings, Inc., and RGC Resources. PSNC Energy, which serves North Carolina, has committed to using the gas should the Southgate portion be built. Since the Southgate portion of the MVP was not in the original proposal to the Federal Energy Regulatory Commission, the extension would need its approval.